Iguanas are native to the tropics of Central and South America. Seeing a bunch of them in Florida was cool—I didn’t have to travel to another continent. On the other hand, Floridians aren’t happy with the damage these invasive lizards can cause. Cathy spotted it first. Across the pond amidst the branches of a tree was a spot of orange. I would have overlooked it, assuming that it was just some leaf coloration. Cathy, however, assumes that everything is a critter until proven different and she was right. 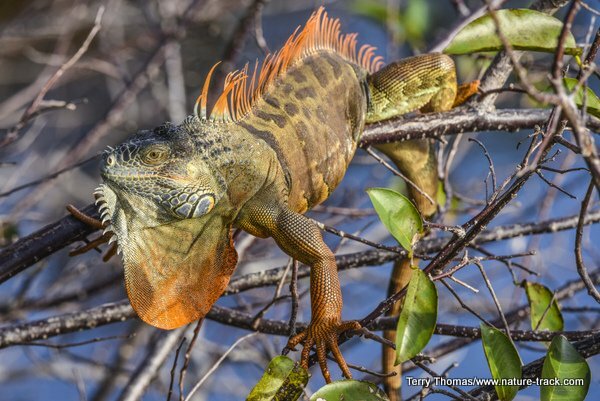 With a gasp, she cried, “an iguana!” Sure enough, that orange speck almost 200 yards away was a huge male green iguana, resplendent with his orange-accented green and black body, large dewlap, fringed back and black and orange stripped tail, the equivalent of an iguana tuxedo. As we continued to watch a colony of nesting woodstorks, cormorants and herons, we spotted one then two, then a dozen other iguanas, first the easy to spot males and then the smaller, less flamboyant females. As we continued around the boardwalk in this South Florida nature park, iguanas were a common theme and I burned through a lot of images on this new species. Our excitement was quelled though, when a gentleman explained that, like the non-native Burmese pythons decimating wildlife in the Everglades, these invasive foreigners are not a good thing. He explained why they were mixed among the bird rookeries. “They are waiting for the birds to lay eggs and then they steal them”, he explained. That seemed strange for a species I thought of as a herbivore, but many herbivores take advantage of easy protein when they can get it. After that conversation, it was a little harder to get excited about iguanas. I still found them exotic and beautiful though and photographed them every chance I had. 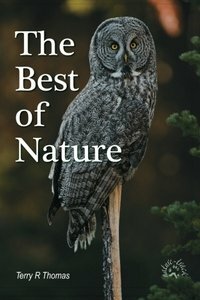 For us, despite being an invasive exotic animal that Florida wished would go back home, they were exciting and interesting. This same scenario played out again and again as we got excited about seeing monk parakeets, mynas and swamp hens, only to find out each was an invasive exotic species that native Floridians love to hate. Therein lies the rub. While I am the first to rail on about the woes of invasive species at home, when I am out of my element, I don’t know a weed from a flower in most instances and I can appreciate life for just what it is. If I see a beautiful field of the weed, leafy spurge, I have no desire to create a photograph that might leave the wrong impression about the damage this plant does. On the other hand, give me a misplaced iguana or swamp hen and I am giddy for encountering a new species without having to travel to another continent and I might just fill a camera card with images of it despite the ecological incongruity. Another experience highlights this. At this same nature park, a very competent birder enthusiastically told us about encountering the elusive Eurasian collared dove, another non-native. Cathy and I looked at each other and grinned. The species escaped captivity in 1978 and has since spread across the country and is plentiful at our house and increasing all the time. But where he lives in Michigan, there are none and he was excited to see his first one despite its status as an exotic. Sadly, many of invasive species we deal with were brought here intentionally, often as pets, and were released or escaped to the wild. While invasive species are never good for an area, sometimes they might provide a lot of enjoyment for someone uninitiated to their dark side. It’s a shame our bad behavior has made some otherwise cool species into outlaws.